Main inspiration for the UGE Office Innovation SE comes from the huge networks of cells that form any living creature on Earth. The 37 trillion cells in the human body coordinate their activities in a live miracle of productivity that we can now try to replicate on the latest and widest office cloud technologies. The Universal Office Problem: There is a huge effort to index, rank and update the lists of problems, priorities, tasks and availabilities in large offices. The Universal Innovation Problem: There is a huge effort to test and rank all possible solutions to a given project. Also to mention here the inspiration from Apple Dev rule of automating a task at the 3rd service request which we adapted and integrated in the UGE Agile process. Combine automatically office service tasks into solutions for budgeted projects to minimize delays and maximize efficiency. Each UGE Office user defines Problems/Projects and Skills/Services using the UGE templates. Each Office Innovator shares with colleagues and friends the Problems and Services he/she wants to share. UGE Office Innovators vote on the top Office World Problems and price their services and budget their projects with money or social currency. Each Each Office Innovator maintains a list of tags of interest defining his UGE Office World. Each Office Innovator runs continuously one or several UGE Innovations Engines budgeted for survival and growth. 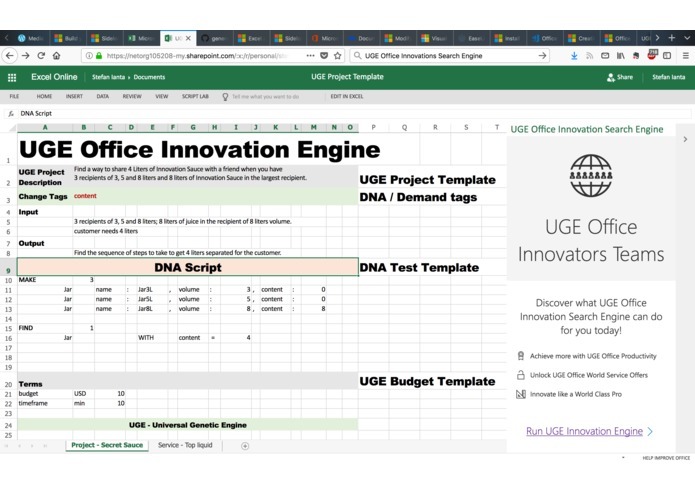 As needed, UGE Office Innovators adjust their Digital DNA/RNA scripts genes to ensure automatic natural selection. Best DNA/RNA Scripts are passed to the next generations of UGE office users and shared with friends and colleagues. Dual Project and Services search engines feed a continuous solution Innovation Search Engine ranking solutions on price, duration and any required test rules. Need of Formalization of Projects and Services guided us to experiment with implementation of genetic processes and the latest smart market theories. 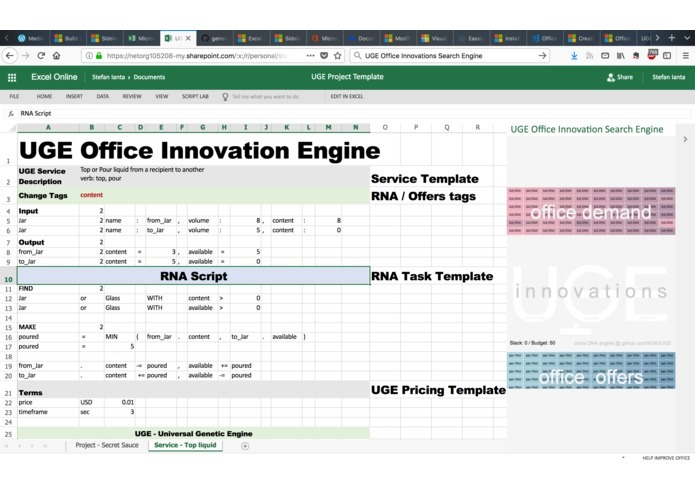 Building an office innovation engine that can run for any office worker: coders, biz professionals and investors. 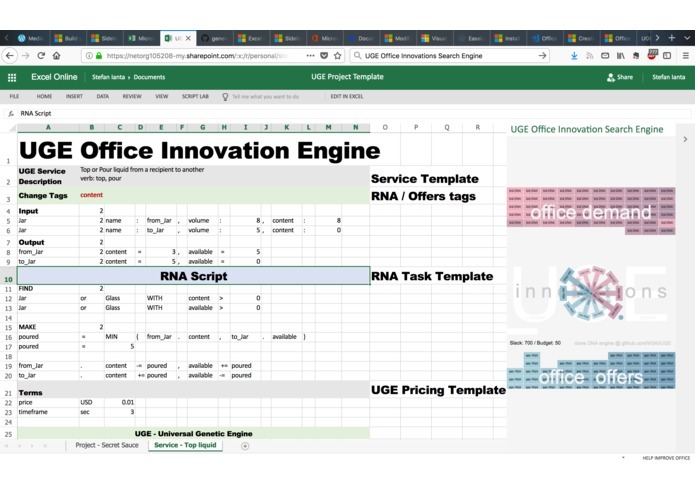 Huge opportunities to combine algorithmically self defined biz services Office/ Excel add-ins can run productivity innovation engines locally or in the cloud. 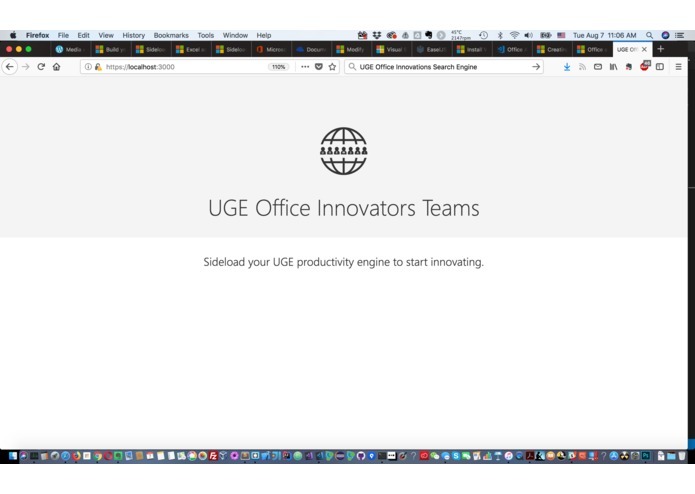 Integrate UGE office Innovation web app with all office solutions and build also a stand alone UGE app for Innovation searchers/miners.